For the past 15 years I have immersed myself in the conservation of the redwoods – those magnificent trees that have graced the Earth for millenia and continue to inspire visitors today. For six years as executive director of Save the Redwoods League, I was privileged to lead the movement to protect these natural wonders. Along the way I helped raise $100 million for redwood conservation, protected tens of thousands of acres of forests and open-space, forged new conservation partnerships, introduced thousands of kids to the redwoods — many for the first time, and helped advance our understanding of these forests. Despite these successes, the challenges ahead are significant. For me, one of the most significant challenges is defining the relationship of people to place. For too long the conservation community has separated people from place. To put it crudely, many conservationists love places more than they love people. And when we protect a place its all too common to exclude people. This is where parks come in — in America, parks are the people’s places. Owned by no one individual, we’re all invited to use them. But even here, the pendulum has swung a long way in the direction of strict protection to the exclusion of people’s enjoyment. Clearly we need to ensure the natural resources are protected for the future, but its time to let people back in to define how they want to use and enjoy the parks that are protected by and for them. With a growing population, a rapidly changing climate, and increased pressures on land, this is no easy task! But for conservation to succeed long-term we need to succeed at this. If you leave Redwood National Park and journey 80 degrees south you will arrive at the coastal town of Valdivia, Chile. These two areas—equidistant from the equator, north and south—are about to be united through a sister park relationship that the League is helping to forge. Separated by 6400 miles, they have much in common, starting with two remarkable tree species. We are all familiar with the coast redwood –Sequoia sempervirens. Its southern relative is the Fitzroya cupressoide, commonly called the alerce or occasionally the “southern redwood.” Both are members of the cypress family and both anchor iconic temperate rainforests that have been subject to extensive logging and are now protected in a series of parks and reserves. If you squint while looking at a photo taken in an ancient alerce forest you could imagine yourself transported to the redwoods. In addition to learning more about park operation and management (I will never look at a trail in the same way having now walked it with a woman who built it! ), we learnt about conservationand the park movement in Chile. For instance, since 1976 it has been illegal to cut any alerce tree or any forest in which alerce is a component. It was also clear that there is a lot we can learn from the Chileans about making parks relevant to the regions they are a part of – a significant part of the funding to build the infrastructure of the new park is coming from the region – Los Rios – which sees a vibrant park as key part of their economy. They are also working hard to involve local communities in the park – Marcelo, their only park ranger, is the third generation from his family to work as a ranger protecting these forests. Although separated by 80 degrees, I felt at home with the Chileans talking about the challenges we are facing and the opportunities that lie ahead. There’s a lot we can learn from each other as we work to protect these iconic forests. On friday afternoon I met Steve Chaney, the superintendent of Redwood National Park, in the small visitor center at Hiouchi in Del Norte county. After 39 years with the National Park Service and five years at Redwood National Park, Steve is retiring and we’d arranged to go on one last walk through the redwoods before he heads to Colorado to spend more time with his grandchildren. Steve Cheney and I enjoy a break on the Lawrence Merriam Memorial Grove bench on the Little Bald Hills Trail. Steve chose the Little Bald Hills trail for our adventure. The trail takes off from Howland Hills Road on the eastern edge of the park and climbs up through the gnarly old redwoods of Jedediah Smith Redwoods State Park — part of the national park. After a few miles we crested a ridge that divides Mill Creek to the west from the South Fork of the Smith River to the east. Up on the ridge, redwood give way to knobcone pine and wind beaten Douglas-fir covered with moss and lichen. We even scared a rough grouse that beat and flapped off down the ridge. This little visited corner of the park feels remote and so very different from the primordial groves that envelop the trails further west near the coast. We turned around at a remote horse camp and swatted mosquitoes while we chatted. As we walked back down the hill I asked Steve what his favorite places in the park were. He chose not to speak of places, but rather moments. He described walking along the fog-shrouded coast earlier this year. Leaving the forest behind and coming across an elk on the beach while off in the distance the fog lifted to reveal an off-shore rock with a golden eagle perched — commanding the scene and drawing the eye. Listening to Steve sent shivers down my spine and reminded me of similar experiences I have been fortunate to have in my 15 years among the redwoods. It was a good reminder to me that although the League’s day-to-day work is about saving land, promoting research, and supporting educators, our higher goal is about enabling these types of moments and memories. Its those moments that make it all worth while. I’d love to hear a few of yours. I just got back from a trip to see the cinnamon-colored giants of Mountain Home Demonstration State Forest in the southern Sierra. It was a real treat to explore a giant sequoia grove for the first time, especially when accompanied by members of the Save the Redwoods League research committee and the forest manager. Mountain Home is owned by Cal Fire, and its 4,800 acres are surrounded by the Giant Sequoia National Monument(same landscape, different ownership). In addition to many great campgrounds, Mountain Home is unique in that part of its mission is to provide a location for forest research and demonstration. And research and demonstration are sorely needed for the giant sequoia groves. Nowhere is this truer than in the 33 groves of the Giant Sequoia National Monument. One of our Councillors told me the story of his trips to see these groves in 1987 ascontroversial logging was underway within the grove boundaries. To put it simply, in the name of reducing the threat of catastrophic wildfire, the forest service leased contracts to log everything but the giant sequoias in a number of these groves. The impact on the groves was catastrophic and the repercussions are with us today. In the 1990 the League was party to a mediated settlement agreement that halted further logging and established protocols for managing the groves. And in 2000, in the last days of the Clinton administration the groves were established as part of the Giant Sequoia National Monument. In the 25 years since that logging, the forest has continued to grow, and in many places the groves are now choked with dense stands of young fir and pine. In fact, many of these stands are so dense that there is a significantly increased risk of catastrophic wildfire that threatens the very existence of the groves. Everyone agrees this is a problem – the fire hazard is real, but there are contrasting views of how to manage the forest to reduce it. But for 25 years well-meaning individuals have fought about how to address this issue through multiple lawsuits. The Forest Service is about to release its latest attempt at a management plan that would pave the way toward managing the groves. I would not be surprised if another round of lawsuits ensued. Unfortunately every year that passes means another year that we have to hold our breath and hope that fires don’t wreak havoc with these irreplaceable groves. While we will never know definitively what the “best” management strategy is, waiting and doing nothing continues to imperil these monarchs. The League’s focus is simple: ensuring that we bring the best science possible to protecting and managing these groves in the long-term. And that’s where places like Mountain Home come in – we can go into the field and look at the effect that fuel reduction, restoration, or logging within the groves has had and make informed decisions about the future. We’ll keep you posted over the coming months as the latest chapter in the history of the monument unfolds. In the meantime, get out there and enjoy the sight of these wonderful sequoias that have stood tall for thousands of years. One of the things I enjoy when I’m in England is playing “spot the redwood tree.” It’s really pretty easy. I once read that if you ascend any church steeple in England and scan the horizon, the tallest tree is likely to be a Sequoia wellingtonia—giant sequoia as we know them in the states. While I have not been up a church steeple in many years, barely a day goes by when I’m in England that I don’t spot at least one towering giant sequoia. Now these are not the thousand-year-old monarchs you find in California’s great sequoia parks, but many are decent-sized trees that are pushing into their second century. I have a run I like to do from my parents’ house in northern England that passes a beautiful specimen by a Victorian house. I always stop to say hello. But the most interesting sighting this time was of two decent-sized sequoias in a small copse by Long Meg and her Daughters. Long Meg is an ancient standing stone, and her daughters are ancient stones in a circle. William Wordsworth described them as second only to Stonehenge. They are in open country with views of the Lakeland Fells (high, barren fields) and Pennines mountains in the distance. Even today it feels like a power spot with deep roots. Do you have a favorite redwood tree? Perhaps one that is outside the natural range of redwoods, maybe even one you have planted. Share your stories and photos with us here, or help us by loading their location into our Redwood Watch program so we can better understand where these remarkable trees grow today. Thank you! Can we halt animal extinction by restoring forests? Nowhere is this truer than in the redwood forests, some of the most productive forests in the world. I also feel we are at a turning point in the history of the redwoods. The story of the redwoods is a familiar one. In a little more than a century, 95 percent of the ancient forest was logged at least once. The places that survived were either too difficult to get to, beloved by some family who made sure they were not logged, or purchased by groups like Save the Redwoods League. The extinction threat in the redwoods is very real, and species including the endangered marbled murrelet, northern spotted owl and wild coho salmon live with it daily. Today across much of the landscape, the redwood forest is slowly recovering. This is happening in parks and reserves – places set aside for their natural qualities. For instance, atMill Creek the League and our conservation partners are 10 years into an ambitious program torestore wildness to this 25,000-acre former tree farm by removing roads and giving young forests a helping hand. And recovery is also underway on lands owned by the timber companies. Yes they still log – after all, most of us love wood, and personally I prefer to know that it comes from a responsibly managed forest that I can go and see, rather than some unknown far-off land. But California’s timber companies have fundamentally changed the way they log – for the better – and are also working to remove the scars from former bad practices, for instance by restoring salmon spawning habitat formerly blocked by culverts. If we are to provide a lifeboat for these species to make it through the coming extinction threat, it is critical that we work together across whole landscapes. We can no longer separate the parks from the timberlands and think of them separately. After all, birds and fish can’t read our maps and make little distinction between a young forest in park and a young forest in timberland. If the past 100 years of redwood conservation have been defined by conflict and forest degradation, I am optimistic that the next 100 years will be defined by collaboration andrecovery. 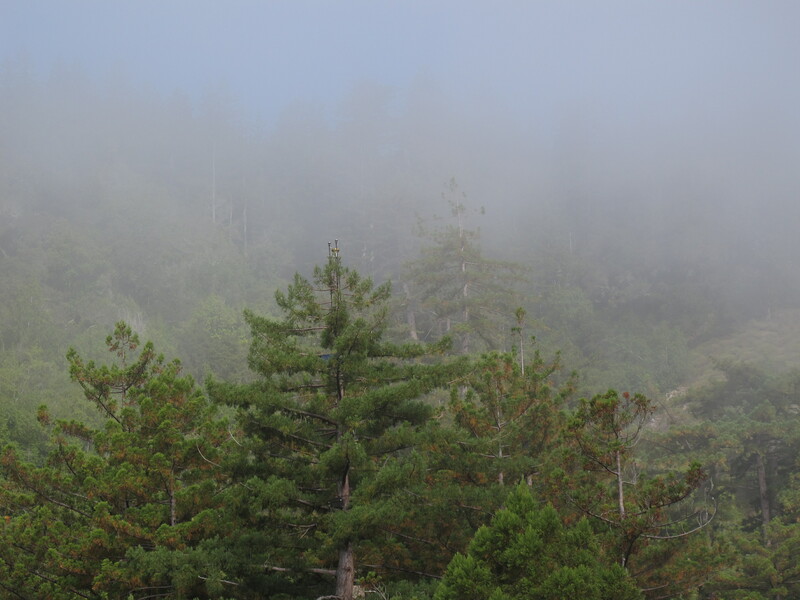 You can learn more about my outlook by reading the keynote I gave last year at the League-sponsored science symposium, The Coast Redwood Forests in a Changing California. Last week up in Prairie Creek Redwoods State Park I overheard two young boys: “Daddy, can I take a photo of the creek?” His older brother commented, “I don’t need a camera, I’m going to take a photo with my eyes.” Pretty profound for a conversation between two brothers under 7. And something I will remember next time I reach for my camera as a crutch for memories. A lot has been written recently about the importance of kids’ and adults’ connection to nature. The book, The Nature Principle, is an example. Physical and mental health are just the start. Some enlightened doctors are even starting to write “prescriptions for visiting parks.” Spend a few days watching six kids under 5 play around camp, and you know it’s all true. So as the summer grips us, I hope you find the time to get away and have fun in the redwoods and parks. I’d love to hear about your summer plans and memories of fun times past. Oh, and please forgive me for writing this on my iPhone while I was swinging in my hammock between two Sierra trees. Not a good role model, I know.